Malaysian Indian poor has zero village safety net. 607 New Villages for Chinese poor, thousands for Malay, Asli, Iban & Kadazan villages for poor. In any part of the world the social safety net for any community is their ancestral and traditional villages. In these villages they get to engage in at least agriculture and lifestock farming for their livelihood. Thus their social safety net beyond which they would not fall. And in these villages they live as a community. Unlike the example of the lone Indian poor ageing lady in her hut and living in worst off conditions than the Orang Asli (see photo).The most misfortunate, disabled, old and orphans are taken care of by the village community. Even the dishwasher from Tamil Nadu a working in Brickfields may be better of than the 5th and 6th generation Malaysian born. Indian poor in the event of any misfortunate, disability or old age, always has a village social safety net to go back to in India. But this is not so for the Malaysian Indian poor. There are almost zero Indian poor villages in One Malay-sia as their social safety net. The few and far in between Kg Muniandi, Kg Ghandi, Kg Kanchang Puteh, kg Chikadee, Kg DBI, Kg Buah Pala, Kg Bengali, etc have denied permanent land titles and have been “ethnically cleansed” or waiting for their day to be ethnically cleansed. Even if there are the few Indian villages, their existence is temporary. As is the temporary solution for the Indian poor across the board in One Malay-sia. Land settled by the Indian poor are deemed squatters and bulldozed or waiting to be bulldozed but land settled by the Malays, Chinese and the Orang Asli Kadazan, Iban are recognized by the State and granted permanent land titles. Even the pre existing poor and landless Indian plantation workers were denied the 442,000 (112,635 Felda) (UM 21/4/10 at page 28), 28,235 Risda and 95,000 Felcra – BH 25/2/2010 at page 4). We are only aware of some of Indians in the Felda schemes in Bahau, LBJ and Trolak and that too granted in the very early years in the 1960s. And never thereafter the ten acre land ownership schemes in Felda, Felcra and Risda schemes, 99% of which have been granted to the Malay muslims. We estimate over one million such ten acre land ownership schemes nationwide including those granted by Mardi, Fama, Agropolition and by the similar 13 State government ten acre land ownership schemes like Kejora, Kemubu, Kedara, Ketengah, etc where zero Indian poor have been granted land. 3) 2,500 acres to 9 Chinese Independent schools in Perak . (NST 31/8/8 at page 38). 4) 10 acres to each and every Orang asli in Perak (NST 9/3/9 at page 8). 26/8/8).And today’s New Straits Times 22/7/11 at page 2, reported that there are 607 (Chinese) New Villages nationwide with 1.2 million villagers. To top it up no less than the Deputy Prime Minister grants RM 100 million to uplift the lives in these New Villages. The UMNO government’s billions to uplift the lives of the Malay muslims, Orang Asli, Kadazan and Iban poor through various government programs goes without saying. But to start off with there is almost zero permanent Indian villages, let alone the millions or billions of ringgit Malaysia to be given to them. The tip of the iceberg case of the Indian poor without the social safety net is that of M. Krishnan (37) who was killed at the Bukit Jallil police lock up. Krishnan’s widow P. Revathi (37) had called over to our office in March 2011 told us that her husband was the sole bread winner who fed his family of six young aged between 8 to 17 years. His pregnant wife can’t even go to work as she has to care for her three toddlers and cannot afford a baby sitter. Even the UMNO Welfare Department refused to grant any emergency or other financial help. At best we know of some similar Indian poor families who were granted a maximum of RM 300 per month and that too for a mere three months and thereafter they have to go begging on their knees for the further RM 300. This RM 300.00 would not even be enough to pay her rentals in Sentul. This RM 300 Welfare help would go a long way if P. Revathi had the village safety net to fall back on. There was zero Indian village she could go back to or go to. The Felda, Felcra, Risda etc ten acre landownership schemes would never take her in. What do we do; we have no answer for P. Revathi. P. Revathi had asked us “What do I do now”? We had no answer we could just watch her cry silently. We do not know what ever happened to Revathi thereafter and we were helpless in the face of the bi-racial One Malay-sian political and economic reality. P. Revathi told us that she is left with no other choice but to contemplate suicide. Tears swelled in the corner of our eyes and we took our sight out of the harsh reality she was undergoing to divert our mind. But we had and till today have no answers. Had she been a Malay muslim the, Lembaga Urus, Zakat, Baitumal, Tabung Haji, Perkim, Yayasan, etc would have bailed her out. Had she been a Chinese some Towkay would have bailed her out as they have been recipients of government largess for decades. Or she could have gone to one of the aforesaid 617 Chinese Villages. Some 50% of the Malay-sian economy controlling Chinese community will somehow care of their poor. And we have the Jabatan Orang Asli, Yayasan Sabah and Sarawak, 25 and 31 Sabah and Sarawak native MPs and hundreds of ADUNs (minus the few Chinese MPs’ & ADUNS) and the whole of the Sabah and Sarawak State governments vis a vis the political power balance they wield, especially now in the post 2008 general elections scenario to care for the Kadazan, Iban, Orang Ulu, Murut poor. But who cared for the Indian poor in bi racial One Malay-sia? There is no Yayasan or Jabatan. UMNO? BN? MIC? Pseudo multi-racial PKR, DAP, PAS, NGO? And when we point out this level of unacceptable and shameful racism and religious supremacy, never seen in any other part of the world, we are in turn are very shrewdly branded as racist by our detractors as a very “clever” means to divert away from this the pressing Indian problems and which this mere 8% Indian community has almost zero political or economic power. This is just the tip of the iceberg one off story of the Indian poor and landless. Many such instances are reported in www.humanrightspartymalaysia.com. Tens of thousands of even the 5th and 6th generation Indian poor and landless nationwide cry in silence every day. Because bi-racial One Malay-sia does not care for them because they are the Indian poor. In bi-racial One Malaysia any issue that concerns the Malays or the Chinese is a ‘national’ issue andaddressed. Policies and programs are only designed to feed these two communities. Only in bi racial One Malay-sian poor and landless their ethnicity matters. The UMNO Government does not have the will to solve the statelessness problem among the Indian poor. Menachi 51 of Kampung Bagan Serai, a widow, unemployed (or should I say unemployable) has for the last 51 years lived a completely faceless and nameless existence. The Malaysian Government has denied her, her basic right, that of statehood, for one meaningless reason or another. Last year Hindraf activists helped cut through the myriad of documents, procedures and hurdles of the UMNO government and managed to submit her application for the IC. Now, almost after a year since the submission, she is called to the IC office. On presenting herself at the counter they ask her for RM210 so she can take her IC. She could not get RM 5 that day to go to the IC office. 210 Ringgits?? She was devastated. She returned empty handed, disappointed one more time, nothing new to her. This is the curse of the poor. There are approximately 400,000 such people. She asks now, if she cannot get the 210 Ringgits, will she remain stateless? This episode raises some very fundamental questions? Will there ever be a permanent solution to this problem? Does this Government have the will and/or the ability to solve this problem? Whose responsibility is it anyway, to resolve problems such as these? Are the poor Indians to be faulted for this problem? What is the role of history in all this? Will any alternative ensuing government have it high on its priority to solve this problem? 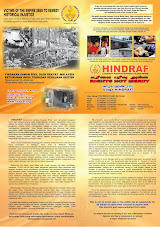 Given the racist agenda of UMNO it is Hindraf’s clear position that UMNO can never solve this problem. I think we have had enough game playing and destroying generations of lives of the poor. The UMNO government has to now own up to the fact that it is incapable of solving the problem. Not to make matters worse UMNO should please stop its spins – “wayangs”. Take this specific Wayang – the most recent one – from the Special Implementattion Task Force for Indian affairs. It starts today on Feb 19 till 26, 2011. The Department of National Registration has provided utmost cooperation by opening up 80 offices in 9 states in Malaysia. This is the largest and comprehensive campaign organized so far. SITF Chairman Datuk Dr Subramaniam announced yesterday (March 1, 2011) that a total of 14, 882 Malaysian Indians have submitted the relevant citizenship forms during the My Daftar campaign held from Feb 19 to 26, 2011. For the next six months ‘SITF My Daftar special unit’ headed by Dato Siva Subramaniam will focus on case solutions ensuring that the 14,882 are approved, encourage the 10,000 who took the forms to fill them, make their submissions and monitor their solutions. SITF Chairman Datuk Dr Subramaniam has asked the Government to set up units in several departments to resolve the problems of the Indian community. He said this was necessary as the Government's delivery mechanism was too slow in coping with the increasing problems of the community. What is clear from this statement is that after 5 months of this latest wayang there is little or nothing to show for results. They said all 14,482 or so of the cases will be resolved in March. What probably has happened is that UMNO’s racist bureaucracy has once again effectively killed any possibility of that. Of course they will have their reasons for the poor showing and it will be all about the poor Indians. What a wonderful escape clause. but those reasons will only confirm our position. The setting up of special units is just more wayang. This UMNO government will never be able to solve the problems of the poor Indians.It is Hindraf’s clear position that this UMNO Government does not want to solve this problem. It is also Hindraf’s position that the root cause of this problem is UMNO’s continuing implicit position that the Indians in the country are all “Pendatangs” after 150 years of living here and therefore are not entitled to any rights of an average citizen. This is so visible, take the Tamil Schools issue, take the Interlok issue, take this statelessness issue, take the criminalization issue – take any issue that is longstanding and chronic and it is abundantly clear that unless racism is first booted out of our political landscape nothing of substance will change in the lives of the poor.. You have to be poor and you have to be Indian – then you will know exactly what this means. Any alternative ensuing government will only make sense to the Indian poor if they give due attention to problems such as this. It does not bode well when Anwar Ibrahim himself said in one of the interviews in January 2010 when he visited the UK that he could not be expected to solve the socio-economic woes of the Indians. Hindraf will not rest till solutions are forthcoming. The people are not going to accept wayangs and or empty promises. The people want results. Hindraf will confront these issues with whoever holds the reins of power unless there are just solutions forthcoming. A teacher allegedly poked a student in his forehead with a ball pen for not been able to copy down an essay on time. The incident took place at SK Puchong Jaya on Monday, which allegedly caused the forehead of standard four student, Timothy Deeran Shegar, to bleed. It is claimed that he was given no first aid until school was over.